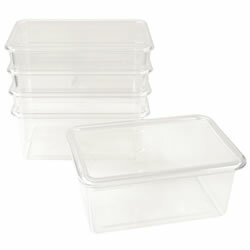 Set of five Storage Bins. 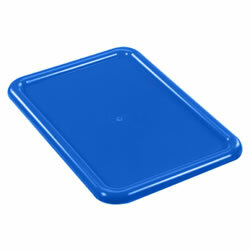 Precision-molded storage trays constructed from quality polypropylene. 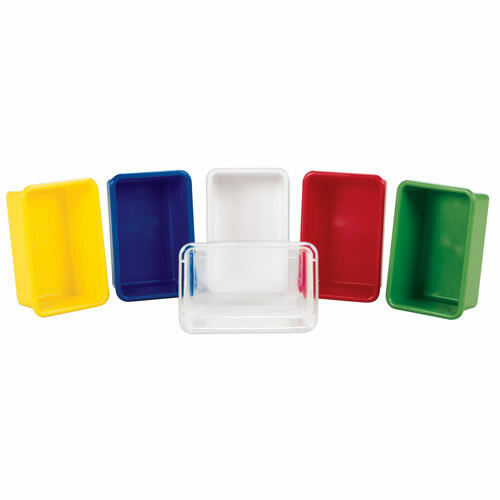 Bins measure 5 1/4"H x 12 1/4"L x 8"W. Assorted set contains 1 each of yellow, blue, white, red, and green only (clear and chocolate are sold separately). Broke one in the first two days. We have already had the corner damaged in the first two days of use. Not what I was expecting. The others seem to be holding up so far, then again, it's only the first full week of school. These bins are so much better than ones we purchased locally. They will last 10 times longer and look much better.